Getting ready for our big debut! The semester is finally winding down, and that means due dates of final papers, exams, and projects and looming closer by the day. One of the more enjoyable final semester projects has been the ancient Greek theater performance for my Attic Tragedy class. Throughout the semester, we have been reading through the works of famous ancient playwrights like Euripides, Sophocles and Aeschylus. While there are a couple classes at CYA that work on just translating these works from their original ancient Greek script, our class instead reads the translated versions of these plays and focuses understanding the breadth and variety of performances that survive today. Tragic performances usually tell the stories of Greek heroes and noble characters who experience misfortune upon misfortune, usually culminating in death. If you think this sounds particularly depressing, you would be right, it is. To balance out the sadness of tragic performances, ancient Greek theater competitions also included a satyr performance. The main difference between a satyr play and a tragedy is the in the supporting cast. While tragic plays used a chorus, or group of singers that had a theatrical role, sattr plays instead relied on a band of satyrs which would provide comic relief in otherwise serious situations. These creatures were often depicted as half-man, half-animal, often intoxicated and always up for a party. 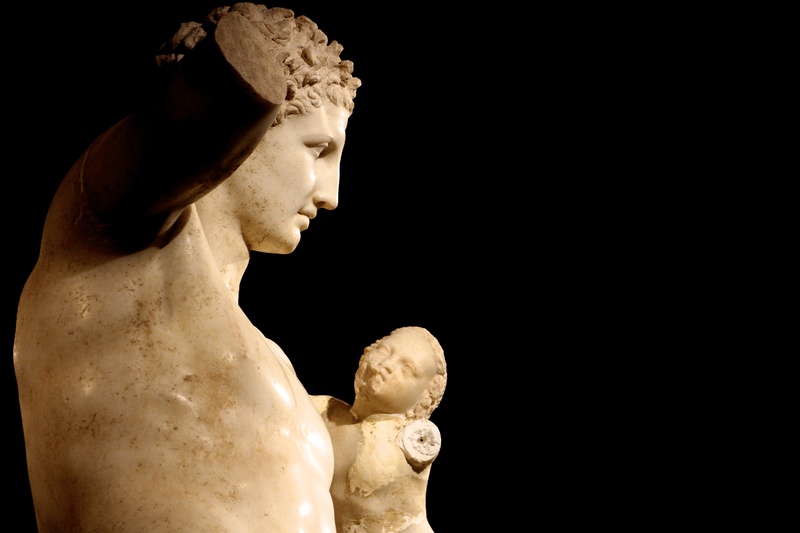 Though satyr performances were a key facet of ancient Greek theater, Euripides’ play, the Cyclops, is the only play of this genre that we have in its entirety. It was this work that our class chose to perform in front of the whole CYA program as our final project. . Though our professor told us at the beginning of the semester that we would understand the plays much better by actually performing them, I did not fully appreciate his words until we actually got to try it out. There are so many aspects of the play that you don’t think about until you have to put on the performance. The chorus is a perfect example. When you just read through a play, you skim over the chorus’s lines as ordinary dialog of a story. For a performance, however, you have to considering if you want the chorus to take turns saying the lines, or all speak in unison. Even the tone of voice used, whispering, shouting or speaking, can dramatically alter the overall effect of the lines. Since the chorus also danced, there is also extensive choreography to plan out and stage directions to take into consideration. By acting out the Cyclops, the story suddenly becomes 3-dimensional and ancient Greek culture opened up in a way that it couldn’t by simply reading words on a page. Even though I am absolutely not an actor (and never will be) I had so much fun playing a sailor that got eaten by the Cyclops. This has definitely been a semester for trying new things and hands-on, active learning. I am so thankful for opportunities like the play that have enabled me to experience Greek culture in a very tangible and memorable way. One of the biggest things that people tell you to do in Greece is to visit Meteora. Because it is such a must-see destination in Greece, I was waiting for a time to go almost since the beginning of the semester. So what is Meteora exactly and what makes it so amazing?? I’m glad you asked. Meteora is a town in the Northern part of Greece (about 4 hours away from Athens by train) that is nestled in the mountainous and rugged Greek countryside. 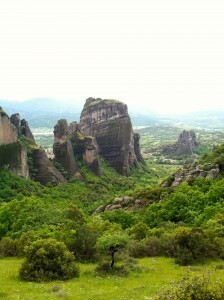 However, the peaks of Meteora are not your average mountains. The foothills that immediately surround Meteora are more like rectangular columns that jut out of the earth in unexpected places, creating rock formations that seem to be carved by a giant. 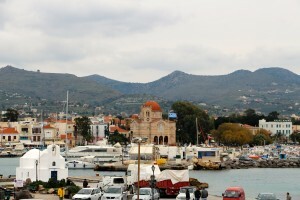 In fact, the entire landscape looks more like the setting of a fairy tale than a humble Greek town in real life. Nevertheless, the most notable part of Meteora are the monasteries and churches dramatically perched on top of the rock pillars. Many these buildings are built so directly on the side of the vertical cliff face, that you can’t help but wonder how any human builder could safely do any construction. In order to get to these monasteries, you can either take a bus from the town in the valley up the road that winds skyward along the meandering rugged landscape, or you can experience some of the world’s best hiking and walk through the woods to see all of the sites. For me, the friends that I traveled with, the choice was obvious. 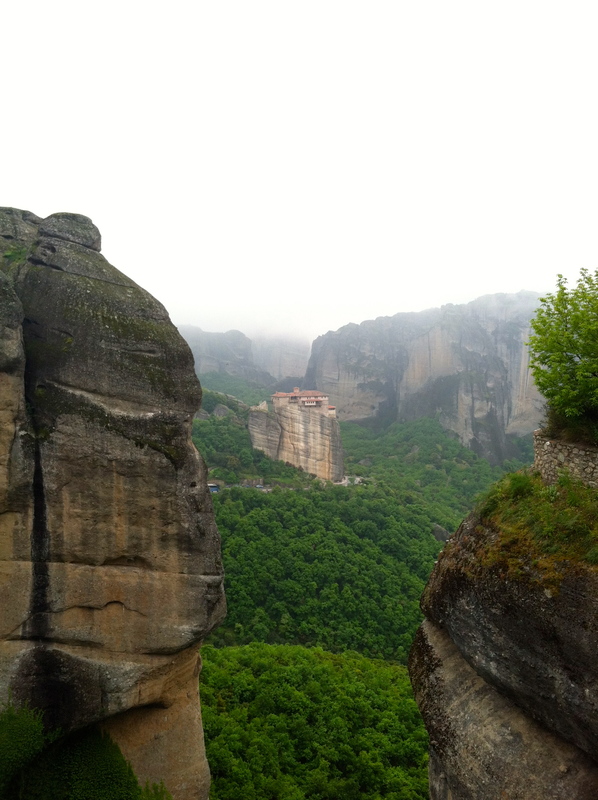 Though it was raining and cloudy for the few days we were there, the adventure of trekking up the steep slopes and down the valleys of Meteora (while occasionally getting poured on) is one we will never forget. The larger Meteora site has 7 monasteries, and, though we at least saw all of them from a distance, we only actually went in 3. The insides of the monasteries are covered with beautiful Byzantine paintings and icons, portraying Christ, the saints, and various scenes from the Bible. One thing that struck me in particular is how similar these pieces are between all the Orthodox churches. The artwork in these monasteries provides a perfect example of how widespread and uniform the images of Byzantine Orthodox art were, across Greece as well as Europe at large. 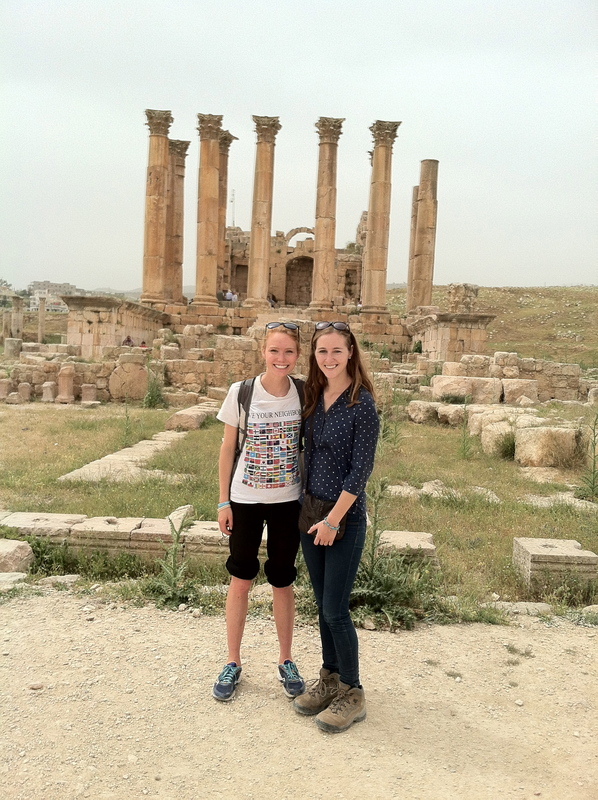 Although the adventures in Jordan were incredible, by the end of the trip I was definitely homesick for Greece. I really feel like Greece is my home now and I have no idea how I will ever be able to leave at the end of May. 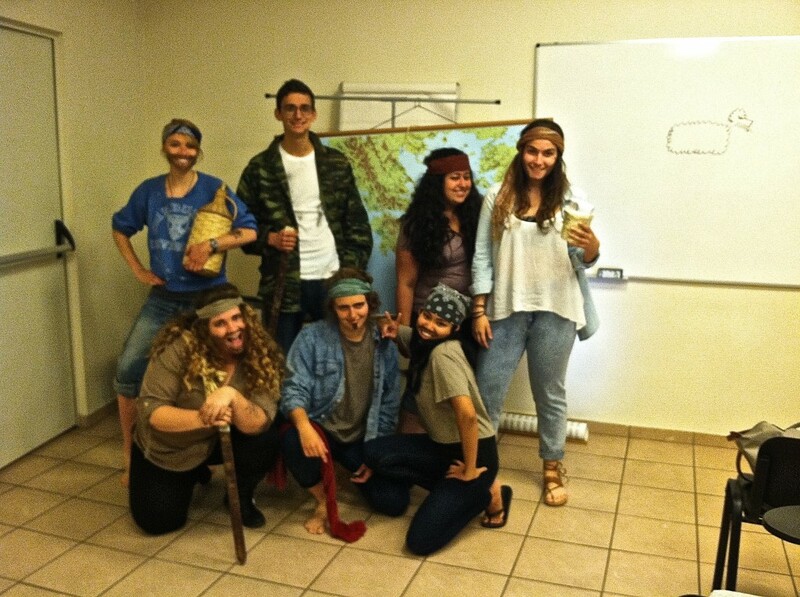 Here’s a quick recap of the end of the Jordan Spring Break trip. After leaving Dana Nature Reserve, we headed north to the Dead Sea where we made a brief detour at a canyon called Wadi Mujib. Even though we only stopped to take pictures, my travel buddy Shea and I ended up making a spontaneous decision to adventure into the canyon. 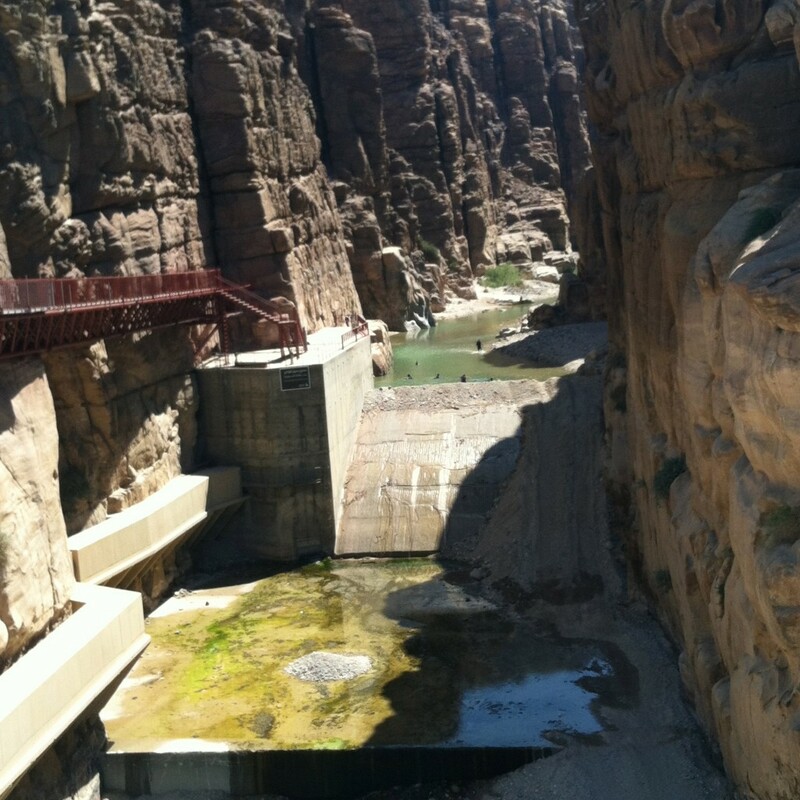 What you need to know is that Wadi Mujib is not like any ordinary canyon. Instead of a normal dirt trail leading you inland, there is a river with big rocks and rapids that you have to swim climb up and rappel down in order to get to the waterfall at the end. After all was said and done and we emerged from the canyon soaking wet, Shea and I agreed that this was hands down our favorite part of the trip: We loved the adventure of fighting through rapids and pulling ourselves through the water with the safety ropes to reach our final destination. I also got to enjoy floating in the water with some local Jordanians. Since the concentration of salt so high, it is impossible to completely submerse yourself. It felt bizarre to try to push myself underwater only to spring back up like I was on a trampoline. Floating in the Dead Sea is something I would definitely recommend to anyone traveling to Jordan. Finally, we finished our travels in Amman, where we stayed two nights in the city center. While there, we met up with a friend who has been studying abroad in Amman for the past year. Hearing about his experiences helped me appreciate some of the main differences between Greece and Jordan. For one thing, my friend said that the strongly conservative Muslim influence made his adjustment from the US to Jordan harder for him than mine was into Greece, where Greek Orthodoxy is practiced loosely, but the people are more western. A particularly obvious example of the conservatism is in dress: Jordanian women are expected to stay fully covered, despite the hot weather. Also in Amman, I felt very acutely that I was in the minority, something that I am not used to feeling in America and Greece. Just walking down the street, my friend and I were stared at, talked to, and asked to take pictures by nearly every person that passed (all men). It was a strange feeling, to say the least. The whole experience made me really appreciate what it feels like to be an outsider. As a pre-health student, Prof. Prokopow has often mentioned the importance of cultural sensitivity in caring for patients. After my experience in Jordan, I will definitely see minorities and other cultures with a new appreciation and understanding of how alienating it can feel to be different. It’s finally Spring Break at CYA!! For our week off, my friend Shea and I decided on a non-traditional spring break location and go to Jordan! Jordan might be the most beautiful, incredible place I have been so far, which is really saying something after traveling around Greece. The culture is very different here, which I have loved, but has also proved to be somewhat challenging: it definitely takes a while to figure out what is socially acceptable and what is not. The second and third day we were in Petra, which is a massive ancient site of tombs and buildings carved into the face of a red rocky canyon. 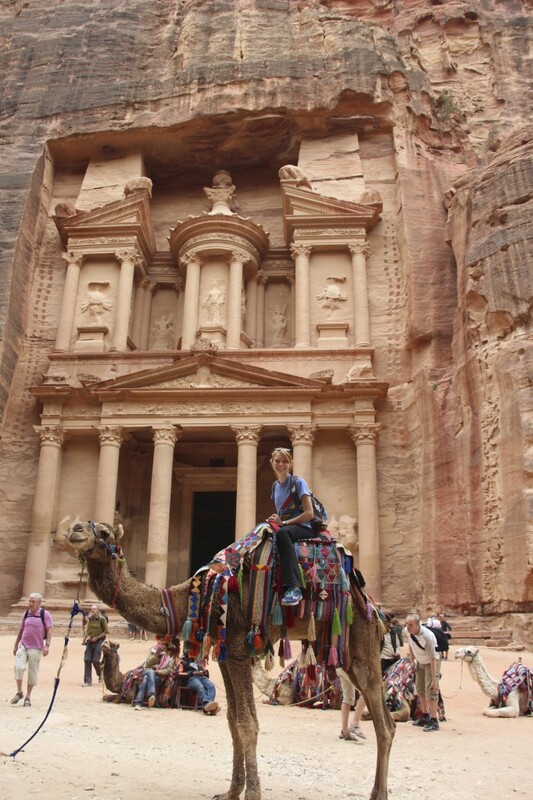 And the best part… WE GOT TO RIDE CAMELS!! And horses! There are Bedouins all throughout the site that try to sell you camel and horse rides. After a while, it gets a little tiring having to keep saying no. While we were there we did a ton of hiking and saw lots of Napatean tombs, the famous treasury building, the great royal palace of Petra, and SO much more. There was still so much that we didn’t get to see since the site was so huge. Early the next morning, we took a bus to Wadi Rum, where we were literally dropped off in the wilderness to hike before being taken on a short tour around the desert. Our guide took us to a huge sand dune (which made me think of Michigan!) to go sand boarding (think snowboarding, but on a gigantic red dune). That night, we stayed in a camping hostel where we got to interact with Bedouins, or the nomadic people group that lives in the desert of Wadi Rum and throughout Jordan. At night, we climbed up one of the rock formations and got to watch the sunset, which might have been the most beautiful sunset I have ever seen. After that, the Bedouins made us their traditional food of potatoes, chicken and vegetables, cooked in a large pot under the sand. The food was incredible. After that, we went spent one day on the Red Sea in Aqaba where we could look across the water and see Egypt and Israel. The Red sea is known for its amazing snorkeling and it definitely did not disappoint. The next day, we left Aqaba and traveled by minibus to Dana, a small town overlooking a massive canyon where you can hike and explore the wilderness trails. Shea and I got a small taste of the trails yesterday, and today we did a longer hike down into the canyon. During our descent, we met a native Jordanian man named Ali who immediately invited us to his favorite clearing to have tea. Shea and I were amazed to see him gather up twigs, start a fire, and pull a teapot out of his bag for warming. Within, minutes, we were having cups of the most delicious, sweet and flavorful tea I had ever had. This is just one example of many that shows how friendly and accommodating the Jordanians are. In that respect, they remind me a bit of people in Greece. Tomorrow, we hope to join a group going to the Dead Sea before continuing further north to Amman and Jeresh. These last few weeks have gone by so fast! At the very end of February, I went on the optional trip with CYA to Istanbul, Turkey. We got up at the crack of dawn (to be at the academic center at 4 am!) and got into Istanbul in the morning only to hit the ground running. We were introduced to the city with a tour of Dolma Bahce palace, or one of the most important administrative centers of the Ottoman Empire. Even though we were all pretty tired, it was impossible not to be awestruck by the intricate, and larger-than-life design and decorations. Picture a mix between pictures you have seen of the inside of the titanic and the castle in Beauty and the Beast. We ended the night with a large, family-style Turkish meal, which was absolutely delicious! The food in Turkey is actually pretty similar to Greek food, except the Turks tend to put more spices in their dishes, which I love! The next day was completely action packed and exhausting but incredible at the same time. I could write a short novel on everything we did, but, to keep this post reasonable a length, I will just give you some of the highlights. We started the day by going to the Blue Mosque, which had such a different feeling than the Ottoman-period Orthodox churches we had seen the day before. For one thing, rather than all the icons and gold mosaics that cover the walls of churches, decorations in the mosque were totally aniconic, or without any images of people. Instead, tiles with beautiful blue Arabic letters and vine-inspired designs spanned from floor to ceiling. It was beautiful to see a building with such a unique design. Next up was the famous Hagia Sophia, which began as an ancient church when Turkey was part of the Byzantine empire, and was later converted into a mosque with the transition to the Muslim Ottoman empire. We could feel a nearly palpable tension between cultures as we walked around the massive building. Stunning gold mosaics picturing Christ and Mary appeared in tangent to equally beautiful Arabic calligraphy and excerpts from the Koran. After visiting the site, I would describe the Hagia Sophia as a church in an identity crisis; both the Christians and the Muslims lay claim to it, so today it is neither church nor mosque, but a neutral museum with an interesting blend of two very different cultures. Some other interesting places we stopped were the location of the ancient hippodrome (or chariot track), an underground cistern and the Topkapi palace, which used to house the Ottoman Sultans. The museums in the Topkapi were particularly incredible, containing the crown jewels of the Ottoman sultans with their gem-incrusted weapons and furniture. That night, we decided to check out a traditional Turkish bathhouse (sort of like a Turkish spa, but based to an ancient Turkish tradition. We had a bit of a crazy experience driving through a riot to get there, but once we arrived, our group was greeted by a wonderful group of Turkish woman who spoke only Turkish. I would definitely recommend the Turkish bath experience for anyone wanting to get a real cultural experience. Sunday, our last day in Turkey, we visited the renowned Turkish markets which are both a shoppers dream and a complete sensory overload. Everywhere you look, store owners are calling you or trying to entice you into their store. Everyone calls you “friend” and promises the best prices “just for you.” As overwhelming as the market is, the prices are much lower than anything you can find in America, as long as you can perfect the survival skill of the market: haggling. Between my friends and I, we all purchased many of the main Turkish market specialties, including the delicious Turkish apple tea, silk scarves, Turkish delight, and beautiful, hand painted ceramic ware. We finished our trip by taking a 2-hour boat trip up and down the Baltic, or the body of water separating the European part of Turkey from the Asian part. After the whirlwind weekend, our group returned to Athens, completely exhausted but so thankful for everything we got to see and do in Istanbul. Wow! These last few weeks have been crazy! Between traveling and studying, there hasn’t been too much time for much else, including writing about everything! 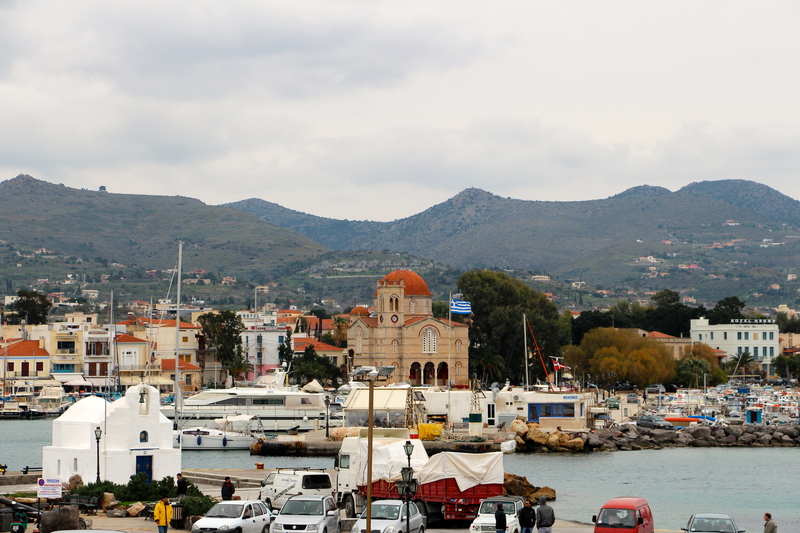 Two weeks ago, the CYA program took all 86 of the students on a week-long trip around the Peloponnese, or the large southern peninsula that protrudes into the Mediterranean. The stops along the way included Mycenae, Epidaurus, Sparta, Mystras, Lerna, Olympia and Delphi. The whole experience was, in word, incredible. I don’t think I could ever do the trip justice by summarizing it into a readable blog-post, but I will try to give a few highlights. The first full day of the trip we visited Mycenae, where historians believe Homer’s Agamemnon ruled. It was incredible to see the old throne room, aka the megaron, the lion’s gate, large tholos tombs, the lion’s gate, and the grave circles where the legendary gold death masks were found. The next day, at the ancient site of Epidaurus, we saw the temple of Asclepius, where the sick would go to be healed by sleeping overnight at the temple. Also at Epidaurus, we were able to run on one of the first Olympic tracks, and see the giant amphitheater, which had nearly perfect acoustics at its center. Over the course of the next few days we traveled to Sparta, Mystras (the settlement built into the mountain overlooking Sparta), Olympia, and Delphi. The museums at these last two stops were especially incredible. Anne Stewart, my myth and religion professor, showed us around the museums and gave us the back story on the most important pieces in the museum. I can’t get over how incredible it is to actually get to see in person these world-famous pieces. There is something so humbling for me about having an artifact I have read about and seen in textbooks for years, just inches away from my fingertips! Delphi was probably my favorite stop on the trip because of the breathtaking and dramatic scenery, controversial history, and wealth of archeological artifacts. The settlement used to be a religious center built high up on a mountain where pilgrims would come from all over Greece in order to consult the oracle (a mysterious old woman thought to have knowledge of the future) for advise. There has been great debate, however, about the exact role of the oracle and how she carried out her job. Controversy aside, it was incredible just getting to walk around the (hilly!) 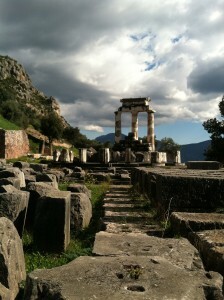 but beautiful site, which included the ancient temple of Apollo. After a long week of traveling, I was actually excited to get back to Athens. 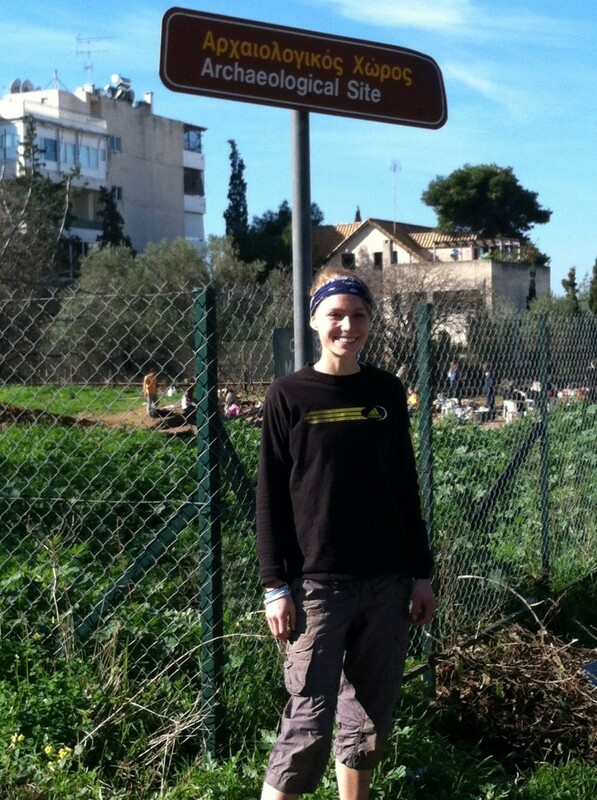 Pangrati (my neighborhood of Athens) really is starting to feel like home! Posted on March 13, 2014 June 6, 2016 Author katherine-haugeCategories Academics, Culture, TravelTags Europe/GreeceLeave a comment on The Peloponese! It is so crazy to think that this is already my 3rd week in Athens!!! I was absolutely incredible getting to work on the dig these last two weeks! After all was said and done, we uncovered lots of walls, a boat-load of ceiling tiles and burnt areas (indicating collapse and destruction), pottery, giant storage vessels, a feeding trough, ancient animal bones and a drainage system. The best part was using all the things we found in order to try to piece together ideas of what the site was used for and who lived there. 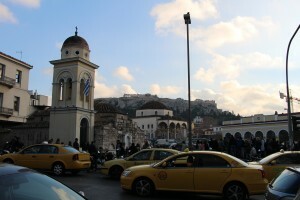 The whole experience of the dig really helped me become more well acquainted with the city and the greater Athens area. 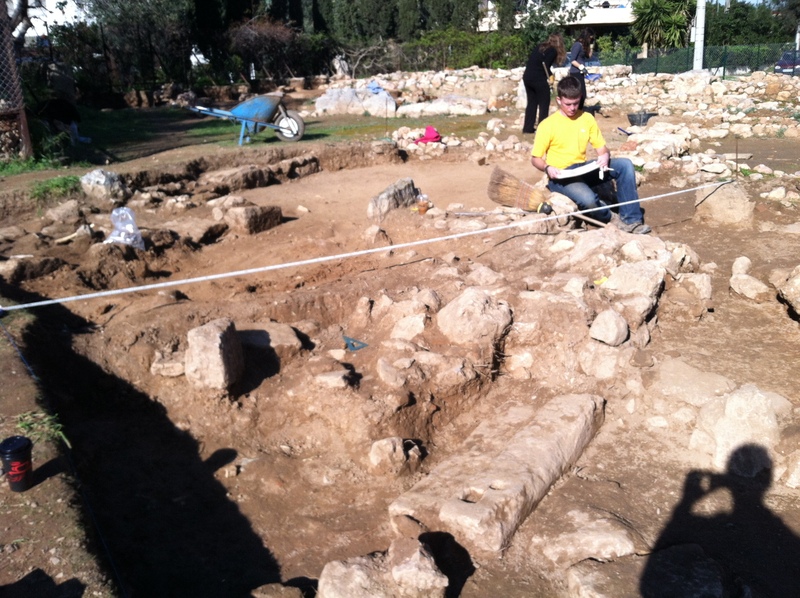 Every day we would get up at 6am to make the hour and a half commute to the archeological site via metro, bus and walking to Voula (a suburb of Athens by the sea). Even though I was pretty nervous to take on the public transportation system, it ended up not being that bad (as long as you make sure to watch out for pick pockets!). I even felt comfortable enough to take the metro on my own to get home from church. I’m really going to miss working on the dig, but there isn’t much time to think about it since orientation is in full swing this whole week. Part of orientation is a survival Modern Greek class, which has been overwhelming but very useful for learning enough to get around. I can’t wait to keep exploring and get more involved in the CYA program! Its my 2nd full day in Athens and its a balmy 60 degrees outside (which sounds wonderful compared to the -21 degree weather in Minneapolis and the blizzards in Holland!!). I’m still a bit jet lagged (The 8 hour time difference is a little bit to get used to!) but its getting a little easier each day. My parents came with me to help me get all settled in, and today we get to find out which apartment I will be living in and get to move my stuff. Yesterday we walked all around the city exploring to get a lay of the land. One of the challenges has been finding grocery stores to get gluten-free food since most of the map directions and websites are all in Greek. Last night we ate at a delicious Greek restaurant which gave a wonderful sample of what traditional food is like here. We had pureed fava beans, a traditional greek salad, and I had some tomato-cumin chicken. Best of all, for dessert, there was yogurt with a fruit syrup. It was phenomenal!!!! We get oriented tonight, and tomorrow already (at 7am!) we take a bus to Voula to start working on the dig. Posted on January 13, 2014 June 6, 2016 Author katherine-haugeCategories Culture, TravelTags Europe/Greece, First View of the parthenon!Leave a comment on Move in day! !